Florencia, 30, and Mario, 29, had a two-year-old son and were expecting their second child. 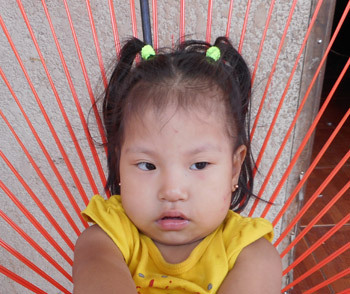 For unknown reasons, Florencia suffered a serious pregnancy complication known as placenta accreta. Both her life and that of her unborn child were at grave risk. Doctors performed an emergency cesarean, but were forced to remove her entire uterus to save Florencia’s life. Although saddened that they couldn’t have more children, the couple was grateful that Florencia and their tiny daughter had survived. It was a difficult first few months after Camila’s birth while Florencia recovered, but their close relationship as a couple was getting them through it. Then, when Camila was just six months old, they were dealt another blow when doctors diagnosed her with a congenital heart defect requiring urgent surgery to correct. Florencia had been unable to work since Camila’s birth, but Mario sustained the family sufficiently well from his job operating a sewing machine at a shoe factory, bringing home about $360 per month. But it would be impossible for them to save enough to cover the cost of Camila’s surgery. Neither of the parents has family close by, and they had no one else to turn to until they were referred to Puente de Solidaridad. As Florencia told the social worker who visited their home to meet the family and evaluate their eligibility for care through the Solidarity Bridge heart program: Having your help for my daughter’s surgery is like a miracle. Thank you. Camila’s surgery was performed on March 18, and she was strong enough to go home the very next day. She continues to do well, and is expected to make a full recovery.